In early 2014 approximately 1,000 tonnes of mixed commercial waste was illegally tipped at the former Master Brewer Hotel in Hillingdon. 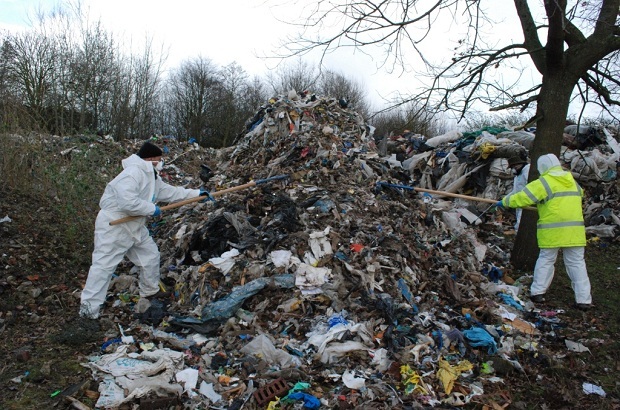 A new development is proposed to take place on this land and the removal of the illegally deposited waste will incur a cost of around £200,000 before the development can even be started. Waste crime is an increasing problem. As well as the investigation in to the illegal tipping at the former Master Brewer, our officers in the Hertfordshire and North London Area (H&NL) are working on several other major investigations. But the fight to beat waste crime doesn’t stop there. We all know prevention is better than cure and our officers also work on prevention and education initiatives across the area. This is a snap shot of some of our officer’s ongoing investigative work. Environmental Crime Officers and Environment Officers from H&NL visited the former Master Brewer site and carried out a search looking for any traceable waste to help us establish those responsible. Traceable waste can include letters, bank statements, postcards or other items with your address on that you’ve given to someone you believe to be a legitimate waste operator for disposal. If your waste turns up tipped illegally our officers would contact you to find out who you gave your waste to. This will get us a step closer to finding the waste criminals. We are also in the process of investigating a similar, incident of mixed commercial waste deposited at a disused warehouse in Dunstable, Bedfordshire. We made an appeal for information, which includes a YouTube video of the site and the waste deposited there. Waste crime remains one of our priority work areas. We employ a wide variety of techniques when investigating environmental crime. As a rule local authorities deal with fly-tipping, but the Environment Agency deals with big, bad and nasty fly-tipping incidents. As well as all the investigation work, we are proactive in tackling, preventing and disrupting environmental crime. For example, we are working in partnership with local authorities to identify fly-tipping hot spots. Where we have identified vulnerable areas we deploy 2.5 tonne concrete blocks to block access for waste vehicles attempting to fly-tip there. Emma Viner is a Senior Environmental Crime Officer in our Hertfordshire and North London team. If you have any information about the above incidents, or to report environmental crime, please contact the Environment Agency on our 24-hour incident hotline on 0800 807060 or you can report anonymously to Crimestoppers on 0800 555111.